Will you join us for a great show and a trip down memory lane? 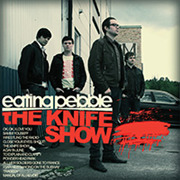 A gig where the sweat of Eating Pebble's fans already clammer to the walls? The nostalgia will hit you straight in the face when you come to see Eating Pebble play the pants off of old HUSET for their 20:th birthday. Eating Pebble start playing 17:45.